LG BP556 review | What Hi-Fi? 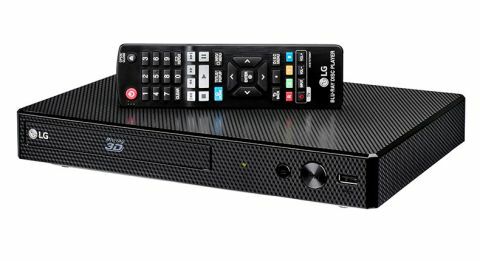 The LG BP556 is a Blu-ray player that isn’t quite as good as it looks. While it has an impressive design, and a range of good features, its picture quality doesn’t match up. It’s clear LG has taken into consideration how its customers will use the BP556 - the ripple effect on its surface distinguishes the player from any other black boxes that might sit around your television, and the disc drive (which supports CDs and 3D discs) has a small indentation in the plastic for your thumb, to help you get a better grip on your discs. The remote is nicely designed too – there’s a dip on its back where your index finger rests, making it more comfortable to hold. The buttons are well-sized and easy to use. You can also use LG’s 'avc5' iOS and Android app to control the player, if you prefer using your smartphone or tablet as your media hub. And speaking of phones, the BP556 has a setting called 'Private Sound Mode', which plays the audio from your smartphone’s speakers or headphones rather than from your sound system. So your movies don’t disturb others around you. If you prefer your sound loud, you also have the option of wirelessly streaming audio to MUSICflow-compatible speakers too. Or you can use the digital coaxial output to connect to a sound system. You’re not going to be short of content to play on the BP556 either. You can access movies and shows from Netflix, Amazon Video, BBC iPlayer, YouTube and Now TV via wi-fi, or by using the Ethernet port. But it’s difficult to get too excited about the BP556’s picture quality because, ultimately, it sits squarely in the middle of the road. Our first impression is: the BP556 portrays skin tones well but, when we put on Guardians of the Galaxy – a film that needs an extravagant touch – it doesn’t capture the vivacity of the lurid costumes and characters, coming across a tad subdued. Similarly, there’s a decent amount of detail to the picture – the BP556 can provide a good sense of depth during the prison break scene, separating the foreground and background nicely without it looking fake – but we’re left looking for more insight into textures. Groot’s wooden body looks a little on the smooth side, and Rocket Racoon’s fur lacks precision to its bristle. We change discs and play a DVD. While there is the expected drop in detail and subtlety, the LG carries more noise in its picture than some rival players, which can be a little distracting. On the audio side, the softness in the picture is matched by a softness and lack of vigour to the sound. It remains listenable but, although it is tonally balanced with good clarity across the frequency range, we would like a bit more dynamism and potency from it. High-energy scenes sound significantly smaller and closed-in, while tense scenes – when the xenomorph queen is revealed at the end of Aliens, for instance – are left a little flat. Newton’s third law says that for every action, there is an equal and opposite reaction. That could be applied here too. For everything the LG BP556 does well, there’s something equally negative that brings it back to a three-star score. This is a player with nice build quality and some great features, but we’d like more sophisticated pictures and sound before we can recommend it.